The whole world is now witnessing the “law of unintended consequences” in the cynical workings of the Democrat side of the Congress, particularly in the Senate. Never in U.S. history have the American people ever received such an object lesson on how the SCOTUS nomination process can be mangled and manipulated in order to sabotage a candidacy. Blaseygate Bombshell: Here’s what really happened between Christine Blasey Ford and the C.I.A. The transparent Kavanaugh assassination plot is just one such scheme that has already produced unanticipated consequences for the perps that they never imagined in even their most distorted and diabolical nightmares. The extremely shortsighted Deep State Democrats only cared about one thing—torpedoing Kavanaugh’s candidacy by any means possible. In so doing, they have sunk their own burning ship. Now the countless liberal rats can be seen scurrying away from the crime scene. KEY POINT: The normal SCOTUS confirmation process of “advice and consent” was morphed into “search and destroy” by the Democrats. Except that the overzealous and extreme left-wingers unwittingly let loose a torpedo into the hull of the dilapidated USS Democrat. Wow, you can’t make this stuff up, nor could a consummate strategist have made such a direct hit! As the rats scamper away from the capsized USS Democrat, they will most definitely be looking for dramatic ways to shift the national conversation—FAST! As soon as they believe they have sufficiently milked the Kavanaugh assassination for all they can, the Deep State will likely carry out yet another false flag mass shooting. The timing couldn’t be better to remind gun control advocates just before the vote that “guns kill, not people”. Of course, that’s crazy liberal logic for you, but that won’t stop the rogue Deep State agents in the U.S. Intelligence Community from executing a mass murder using 5 or 10 assault weapons (e.g. AR-15s equipped with bump-fire stocks). These liberal criminals think nothing of killing a whole bunch of innocent American citizens with military grade weaponry in order to compel the vulnerable politicians to push gun control legislation. Let’s face it: there’s no more important mission for Deep State to accomplish than to take away our firearms. This particular goal of Cultural Marxism is so critical to the globalist agenda that they know their New World Order is DOA unless they unconstitutionally repeal the right of gun ownership. Therefore, it’s almost a sure thing that the Soros-controlled NGOs in collusion with criminal elements within the intel agencies and mainstream media hitmen will orchestrate a false flag attack on a strategically chosen American venue. The primary purpose will be “Shock and Awe” to distract from their rapidly emerging Blaseygate scandal. Because Blaseygate was also implemented to distract from the Democrat’s Russiagate fiasco, the Soros-funded Left is clearly more desperate than ever to divert the attention of the electorate between now and November 6th. (BLASEYGATE: A Democrat Deep State Scandal Also Designed as a HUGE Distraction from…) From a firefighter’s perspective, each successive political conflagration started by the Deep State Democrats sees them pouring more and more fuel on the fires to somehow cover up the previous blaze. This is why it’s imperative to be vigilant for the rest of this month and right up to Election Day. The level of desperation on the Left has reached stratospheric levels and shows no signs of changing its trajectory. Everything the Democrats did in the process of character assassinating Kavanaugh reveals such a degree of unparalleled recklessness that the Right should expect more of the same. Hence, the Patriot Movement needs to be totally on guard and not easily provoked. Many of the pre-appointed MK-ULTRA mind control programmed alters victimized by the C.I.A. for this very moment are being triggered, both individually and collectively, during this critical time frame. Therefore, it’s best to avoid confrontation whenever possible and to be aware of agents provocateurs at public events, especially planned protests and Democrat-controlled venues that are hosting conservative speakers. It’s crucial to understand that the Mainstream Media (MSM) has been conducting fake polls throughout this entire campaign season, as they always do. The card-carrying MSM agents of the CIA’s Mockingbird Media, as it’s also known, have been falsely reporting that the polls are favoring Democrats in races across the nation. 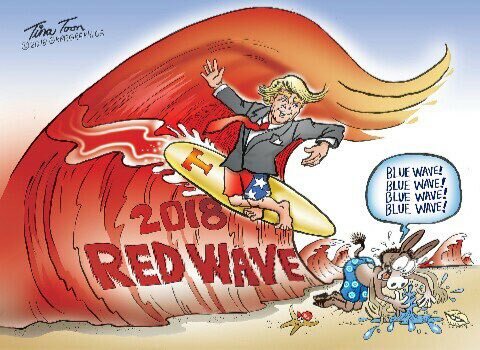 Just google “blue wave”, the meme stealthily created by the DNC and Big Tech to portray the spate of expected Democrat victories, and it’s easy to see how early in the game this psyop was actually initiated. Obama and Clinton, Biden and Sanders, Schumer and Pelosi, Harris and Booker, Schiff and Blumenthal, Waters and Warren, Brennan and Clapper et al. have all connived to fabricate the “blue wave” illusion that’s about to be overwhelmed by a massive red tidal wave. And they don’t even see it coming so much does the Left believe their own propaganda, just like the stunning Clinton rout of 2016. Nevertheless, the fictitious polling results can’t help but influence voters between now and November 6. Everyone likes to say they voted for the winners so the manipulative hyper-progressives routinely collaborate with their MSM co-conspirators to cynically move the unaware masses to the left. This is precisely how elections are rigged every year. The electoral process, in fact, has many points of structural weakness that are taken advantage of and criminally abused by the Democrats. And, they are going full-bore this year because of what’s truly at stake. The best response (and action) to these corrupt Democrat schemes to fix the election results is to raise awareness through education…and by conducting exit polls. Exit polls are especially effective in preventing election theft. When 55% or 65% or 75% of the respondents say they voted Republican in a specific race, it makes it quite difficult to get away with naked electoral fraud. While it’s very easy to hack the voting equipment, at the end of the day the numbers have to add up; however, candidates and voters alike must demand recounts whenever appropriate and/or other forms of election result scrutiny. 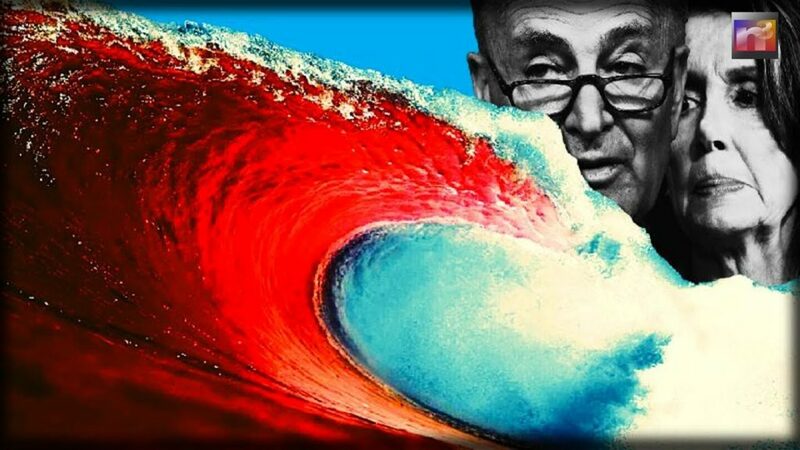 The Democrats will see their tiny blue wave alright … …. … which will then be followed by a HUGE red tsunami. The funny thing here is that, before the Democrat’s Kavanaugh fiasco, the Right was not very motivated to show up at the polls. That’s all changed now thanks to the September “Shock and Awe” known as Blaseygate. The Deep State perps simply never foresaw the enormous political quake that was generated in the American heartland and Deep South. And the DEMs still don’t see this thing coming! “WE TOTALLY REJECT YOUR INSANITY … for the sake of future generations as well as ourselves. At this point it really makes no difference if Brett Kavanaugh is confirmed or not by the Senate. 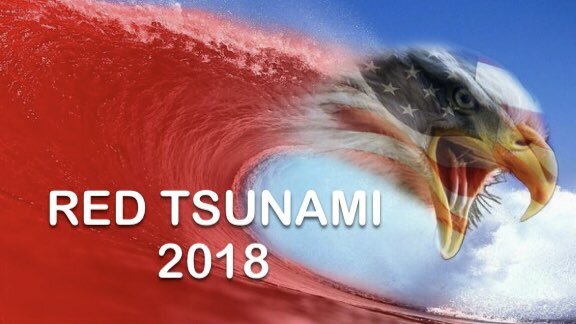 The earthquake has already happened; the red tsunami has formed, and it’s getting bigger by the day. 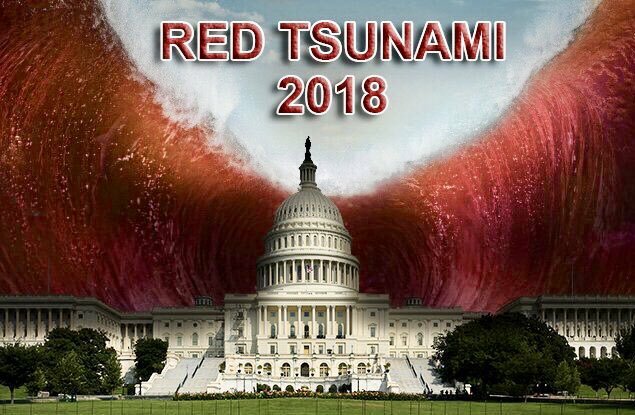 Now it’s time for the undecideds to join the immense RED wave and watch it overwhelm the little blue ripple. The October SURPRISE of 2018 to be Preceded by a September SHOCK & AWE! VIDEO: The October SURPRISE of 2018 to be Preceded by a September SHOCK & AWE!